What’s the International Symbol for Confusing? In the days of yore (approximately 2009), Vibram Fivefingers sported a model made out of Smartwool—that warm, user-friendly material known mostly for being made into cozy winter socks. Recently, I purchased a pair of these discontinued Fivefingers to act as an alternate to the beloved pair (Komodosport) I bought this summer in Montana. It is unlike any other clothing sticker I have ever seen. 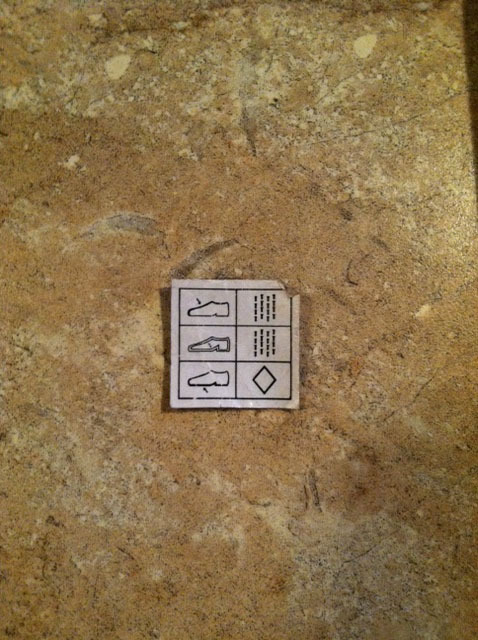 The layout is fairly complex for a small sticker (less than one inch square), and the symbols are completely unrecognizable to me. What were the manufacturers trying to tell me? How to launder the shoes? No. Which religion to choose? No. How to interpret their dreams? Hmm, I hope not. This is the top of your shoe. This is the inside, where you put your foots. This is the bottom, which is what you walk on. An interesting theory, for sure! Does the sticker have anything to do with why Vibram doesn’t make this product anymore? Perhaps they just couldn’t deal with all the phone traffic, and instead decided to end their consumer-friendly partnership with Smartwool. Do I need to get a copy of the Symbol Sourcebook to decipher this message? Is it a recipe for a really ripping lentil soup? Dear readers, do you have any ideas that might illuminate the mystery? As someone who is always trying to find out whether shoes are leather or not: They tell you what different parts of the shoe are made of. The left hand side shoes what part of the shoe they’re talking about, the right hand side has symbols for materials. 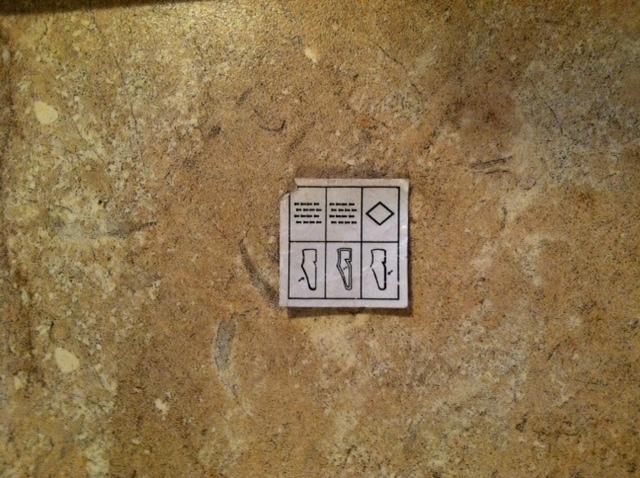 I believe the first two mean fabric, but I know the last one (the diamond) means synthetic. The symbol for leather is a silhouette of a cowhide. Wait…Vibram made Fivefinger shoes out of SMARTWOOL?? And then DISCONTINUED them?? Why didn’t I know about this?? I NEED a pair of wool Vibrams!! Where did you get them??? Ebay! They were made in charcoal (my color of choice) or champagne. Good luck! I had to stalk out a few listings before I finally won a pair.